While the majority of the high school athletic world has its focus on basketball and wrestling during the winter months, North Marion senior Samantha Baylie only has eyes for softball. 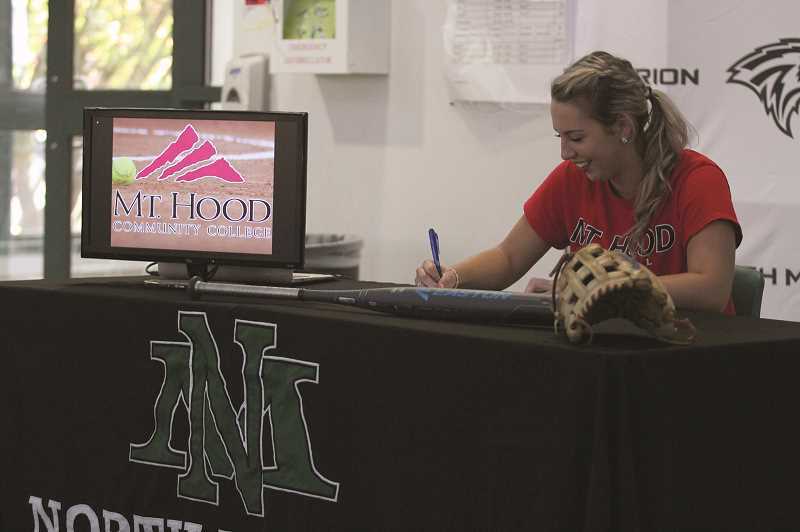 A three-year starter for the North Marion varsity softball team, Baylie recently signed her letter of intent to continue her playing career at Mt. Hood Community College, creating the next pages in a story about softball obsession that began nearly a decade ago. "I was a little nervous, but I'm excited," Baylie said after a signing ceremony on Nov. 1 in which she committed to play for Saints after she graduates from North Marion High School this spring. Baylie was a relative late-bloomer in the softball world. While many athletes of her caliber are trained to hold a bat before they can walk, Baylie didn't pick up the sport until she was nearly a middle school student. "I started when I was 11, so I haven't been playing that long," Baylie said. "I just fell in love with it." With that love came a dedication by Baylie to commit to softball as a year-round sport. While her peers were playing basketball in the winter and volleyball in the fall, Baylie was extending her softball experience at the club level and through travel teams that took her up and down the West Coast. "I wanted to play volleyball," Baylie said. "I tried that, and it didn't work out with softball because I was playing year round." While living in a state recognized for its wet, drab climate from October through March, that means Baylie often spends much of her weekends throughout the offseason playing outside the state. "Last year we were in California like every month during the winter, it was crazy," Baylie said. "We play in Portland and Hillsboro, but most of the time we travel. It's definitely difficult." The constant commitment to the game comes at a cost, cutting out opportunities for a regular weekend social life and forcing Baylie to complete weekend homework assignments on car rides or on plane trips for longer excursions. But the commitment has certainly paid off as she looks ahead to her coming spring season with the North Marion Huskies. Baylie has been a dominant force in 4A softball since making her high school debut in 2016. 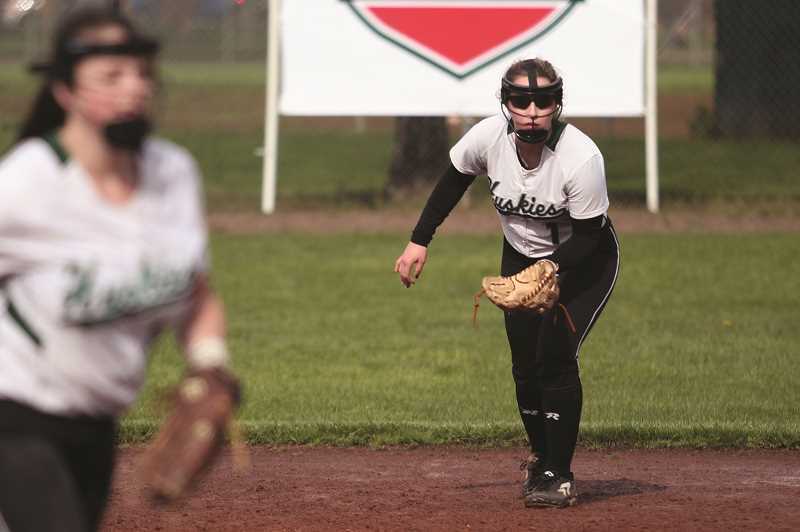 As a freshman, Baylie garnered First Team All-League honors in the Oregon West Conference as the starting centerfielder for team that finished second in the league standings and qualified for the state playoffs. Although the Huskies had a difficult season her sophomore year, winning one game and finishing at the bottom of the standings, Baylie continued to play exceptional softball. She bumped her batting average up from .385 as a freshman to .426 as a sophomore and was nearly perfect in the outfield, committing just one error for a .980 fielding percentage to earn First Team honors once again. For her junior year, the Huskies featured a team with nine freshmen on the varsity roster, and Baylie was asked by first-year head coach Jon Santos to move into the infield to help provide a veteran presence closer to the action. Baylie made the transition seamlessly, improving her fielding percentage to .986 at second base while improving her already prodigious numbers at the plate. She turned in a stellar year in which she led the team in nearly every major offensive statistical category, batting 39-for-77 for a .506 average while scoring 34 runs, driving in 18 more runs and stealing eight bases. She once again earned First Team honors in the end of season awards, but was additionally recognized as a Third Team All-State. The Huskies also saw significant improvement, winning six more games while seeing major gains from its young, rising core. Along with another year from Santos, who also serves as Baylie's coach for the Canby Rebels 18U team, Baylie is looking forward to the coming spring season when the Huskies move back to the Tri-Valley Conference and will seek a state playoff berth after a two-year absence. "It'll be better than all the other years," Baylie said. "We're starting training right now with the hitting coach. We'll definitely be more prepared there. I'm super excited." Following the end of her high school career, Baylie will transition to a Mt. Hood team that is coming off a 27-16 season in which the Saints finished second in the Northwest Athletic Conference's South Region. The move to Mt. Hood Community College appeals to Baylie because it allows her two years to build her academic base while figuring out how she wants to specialize her education in the future. "I didn't know exactly what I want to do or what I want to study yet, so I figured why not go to a two-year college?" she said. "They're giving me a full ride, basically, so I'm going for free, and I still get to play." She'll move back to her natural position in the outfield for her two-year stint at Mt. Hood, and from there, if the opportunity presents itself to continue playing at the next stage of her educational and athletic career, she's game. "Hopefully if I find the right fit," Baylie said, "I'd love to play for four years at school."